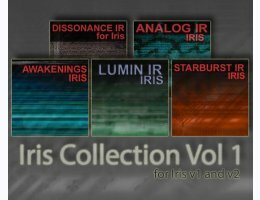 This collection compiles the first 5 Iris Releases into a single product. Instruments are constructed using 1-3 Samples and take full advantage of the Spectral Features of Iris and most have Aftertouch assigned to the Filter Cutoff. The intention was to provide musically useful Pads full of texture and movement. All 919 included WAVs are also available to explore when creating your own instruments, or in other music products that can use Wavs. Analog IR provides 110 Beautiful Pads for Izotope Iris using samples that were designed using an Elektron Analog 4. The sounds for Awakenings were created using combinations of many synths to create an interesting and varied collection of samples. The intention with Dissonance was to represent Alien worlds and the darkest corners of the universe, although there is some occasional beauty. The Lumin Samples were crafted using UHE Bazille and Waldorf Largo for sound design. The Starburst Samples were designed using an Access Virus TI Synthesizer.